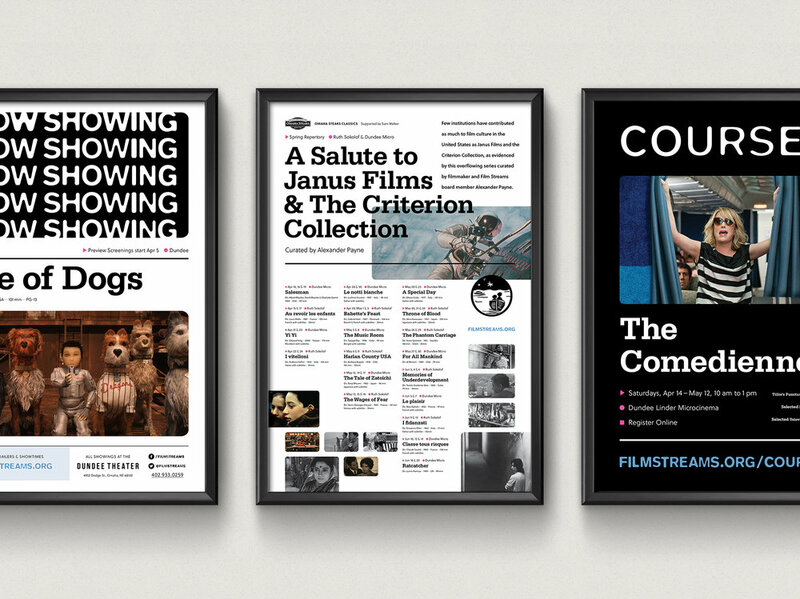 Brand evolution for a nonprofit cinema devoted to the presentation and discussion of film as an art form. 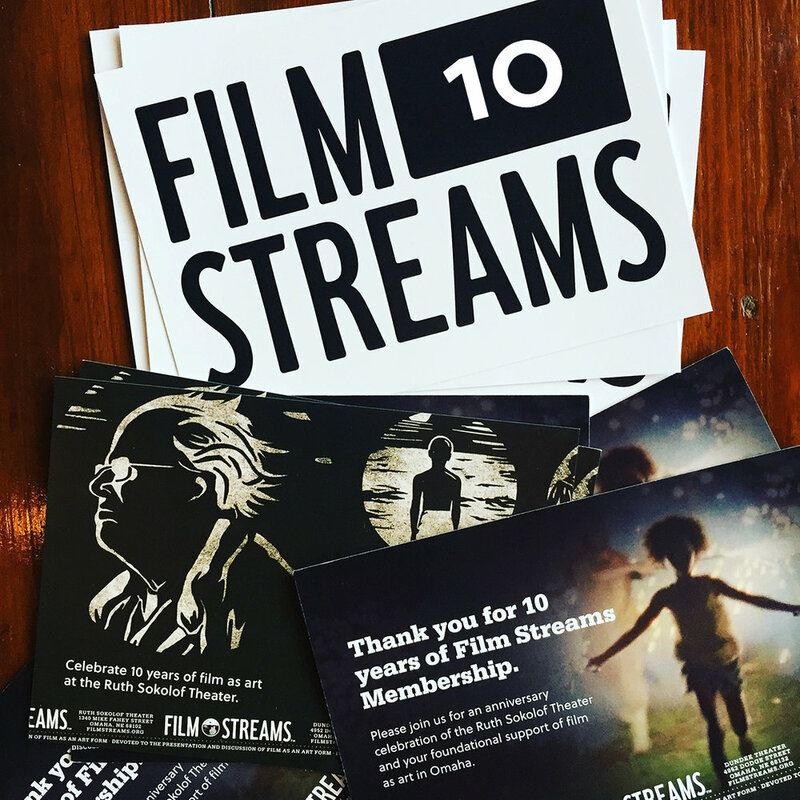 Film Streams celebrated 10 years at the Ruth Sokolof Theater in 2017. That same year they opened their second location at the newly renovated Dundee Theater. As they moved into their second decade, now overseeing two distinct cinemas, their brand identity evolved to showcase the two locations and to confirm their place as a key cultural institution intent on pushing Omaha’s creative culture forward. Their original branding was created by Oxide Design Co. led by Joe Sparano. When the project found its way to JKDC, which included all print and digital materials as well as a new website, the team assembled was very mindful not to “mess it all up.” Working closely with Deputy Director Casey Logan and Executive Director Rachel Jacobson, the brand evolution took what was currently working really well, re-emphasized the organization’s dedication to film, and delivered an expanded identity system that can continue to be built upon over the next 10 years. The logo “roller stamp” designed by Oxide to repeat continuously like a film strip was maintained as a brand element but pushed towards the background. We also kept the original logotype, arranging the letters around a “screen” which became the core element of the evolved brand. The theater names were added below the logo in customized gothic letters. Finally, we decided to emphasize the original linocut drawing of a scene from the film The Night of the Hunter designed in 2005 by Sara Jacobson. It became part of the primary logo screen and was the inspiration for a large set of linocuts based on important films shown over the life of the Film Streams organization. The collection was illustrated by Plaid Mtn. The screen then became an integrated way to communicate specific information, either through type or image. The launch of the evolved brand came on anniversary weekend in the summer of 2017. Invitations went out for special screenings of Harry Potter, Moonrise Kingdom, and Moonlight. Filmgoers that weekend were the first to grab the latest T-shirts, posters, and other swag. As the summer went on, the organization’s social media presence was updated, new email newsletters were sent, and updated print materials started to appear around the city. 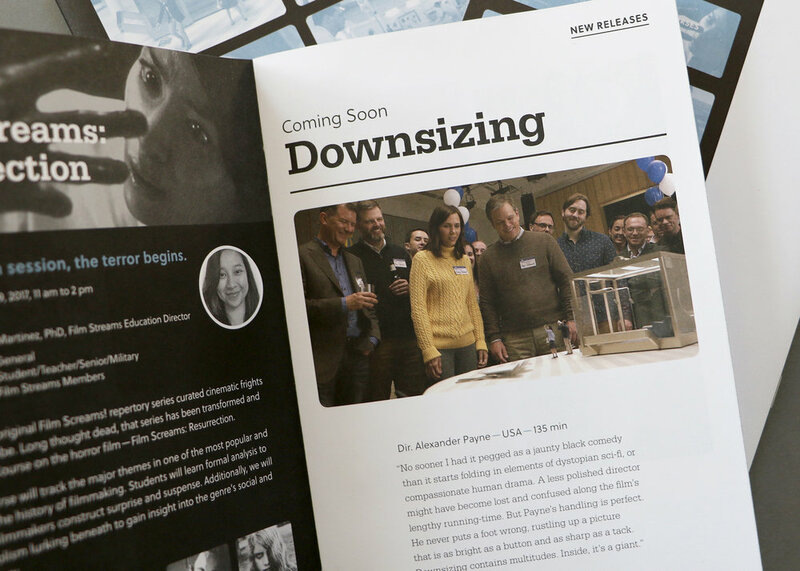 When it came to the quarterly newsletter, a very important piece of collateral for Film Streams, a booklet became the new format to house 3 months of programming. The self-mailer goes out to all members and gets dropped off at businesses across the city. Its contents include all films, courses, collaborations, special events, and general information. Well, we should do that. Aside from print materials showing up around the city and in mailboxes, the theaters had more opportunities to highlight programming. Large format posters, flyers, coasters, and postcards could be seen at both locations. Posters were designed around courses and the latest repertory series while standard designs were made for “Midnight Movies” and “Sights on Sounds.” The designers were driven by film stills or the various type treatments included in the updated brand. 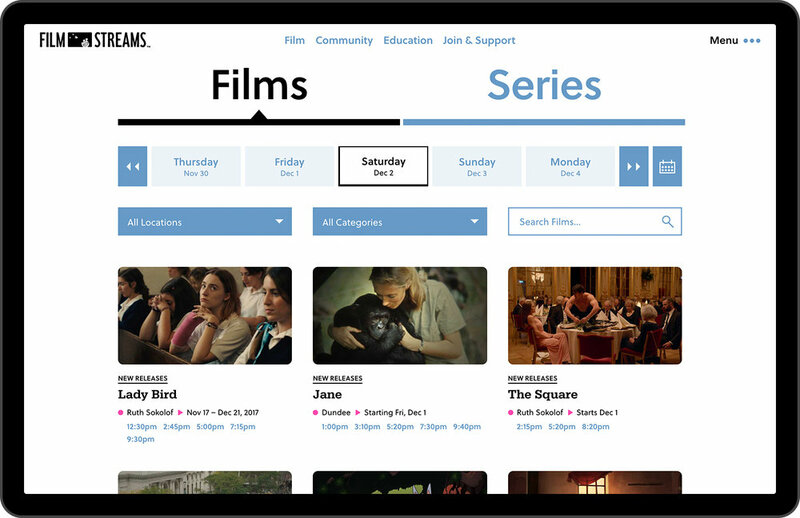 To emphasize the films showing at each location and to reflect the mission of the organization, the new FilmStreams.org was designed around simple site navigation and having a compelling visual for every piece of content. In most cases, a film still. Film, Community, Education, and Membership were the main pages of the site. Showtimes for films currently being screened were designed to be easily accessible. From the outset, planning for a site very heavy on content with over a thousand individual film pages, our approach focused on keeping the number of different page types limited while allowing varying types of content to feel unique. Series, Courses, Events, News, Membership, the Film Vault, and all needed informational pages utilized the same components. This kept the budget in check, the workflow streamlined, and the pages clean. Movie theaters and nonprofits each have their own content requirements. While movie theaters deal with daily (even hourly) content changes (films, runs, showtimes), nonprofits are heavy on informational content (programs, donate, mission). We utilized Craft as our CMS which empowered us to create an editing experience that was tailored for both ephemeral and evergreen content. 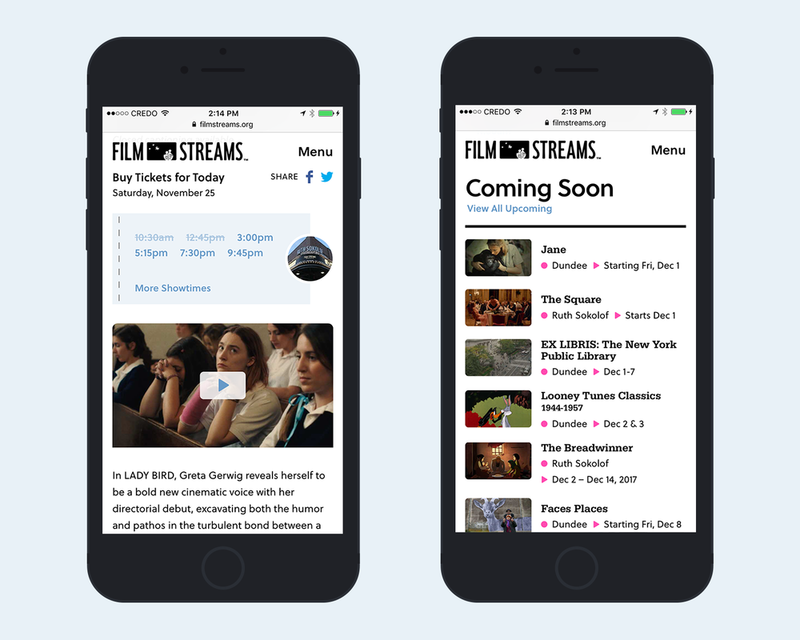 For site visitors, we knew we wanted this iteration of the Film Streams website to be fast. We implemented a fairly robust responsive image strategy to keep page weight down. We also spent a lot of time refining the caching strategy to ensure that sections of a page that featured ephemeral content (showtime and ticketing information) could update frequently without causing an entire page to be re-cached. 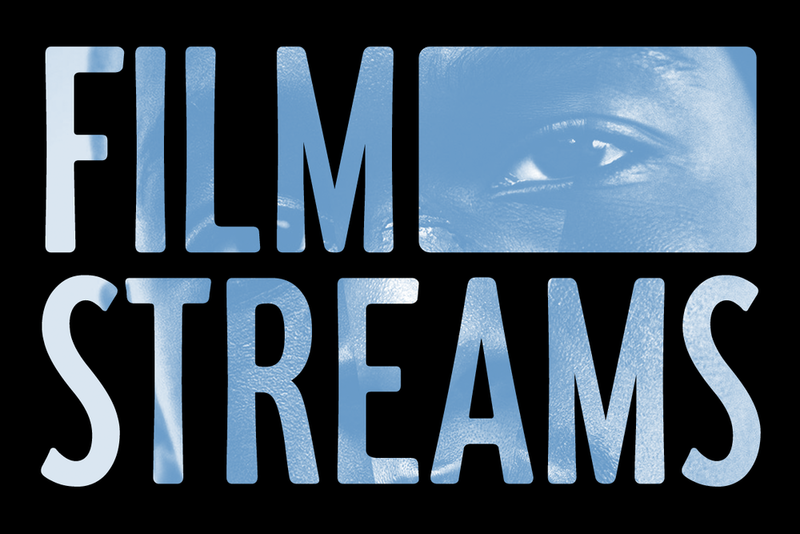 When you become a member of Film Streams, you support film as an art form and help the organization continue to bring amazing stories to the city. With 10 years down, what they do in this next decade will surely be something to see. Looking back on 2017, their Annual Report was the final project of this brand evolution. We led with a bright pink spot color to emphasize the importance of the year: a year of the woman, Lady Bird, and the neon pink signs at the new Dundee Theater. Fun fact: In a year when Hollywood’s gender inequities were laid bare and just 11 percent of the top 250 new releases featured women directors, a quarter of the films screened by Film Streams were directed by women. Our partnership began in July of 2016. Involving everything shown here and countless other brand needs for print and digital, I also worked with Film Streams on their “Bring Back The Dundee” campaign as well as the graphic design for the Dundee Theater itself. It’s been quite a journey. It’s hard to overstate the pride I have for the work we did together and the appreciation for the opportunity to get to collaborate with such visionary people who care deeply, are super thoughtful, value fresh thinking, and are open-minded as hell. Special shoutout to Casey Logan and his unwavering dedication to making all the pieces we worked on the best they could be.